SETTING: Eons ago, on a world similar to, but different from Earth—when humans were just primitive, barely evolved primates—Earwa was ruled by a powerful elder race called Nonmen. During this time, an alien ark populated by powerful but malevolent sentients—the Inchoroi—crashed onto the planet. In the ensuing conflict known as the Nameless War, the Inchoroi were mostly exterminated and the Nonmen doomed to extinction while humanity slowly developed into a flourishing civilization. Two thousand years after the First Apocalypse and twenty years before “The Judging Eye”, the Prince of Nothing trilogy follows Anasûrimbor Kellhus’ rise to prominence as he eventually becomes Aspect-Emperor and God Incarnate. Proclaiming that the Second Apocalypse is at hand, the Aspect-Emperor assembles the mightiest human army Earwa has ever seen—at least since the fabled times of the First Apocalypse—and prepares to lead the Great Ordeal to attack the Consult in its lair at Golgotterath. First though, the Aspect-Emperor must target the City State of Sakarpos, the gateway to the North. Sorweel, Heir Prince of Sakarpos, will be drawn into the Aspect-Emperor's powerful pull when tragedy strikes, but how will his conflicted loyalties finally break? Esmenet, the former prostitute-turned-Empress, continues to care for Kelhus’ children. Of these there is Kelmomas, the youngest boy and a willful seven-year-old who craves his mother's attention which he thinks is focused too much on his twin brother Samarmas. Drusus Achamian meanwhile, has retreated from the world for the last twenty years to dream about Seswatha and revenge against Kelhus. Acha is protected from the reach of the Imperial Agents by Kelhus as long as he does not meddle, but when he starts having strange dreams about Seswatha and then receives an unexpected visitor, Acha decides to embark on a quest to expose Kelhus for the fraud he believes him to be. FORMAT/INFO: “The Judging Eye” stands at 448 pages divided over a Prologue, a bridge ‘Interlude’, and sixteen chapters. Each chapter is titled based on the location of its action and features a quote from the religious and philosophical lore of Earwa, followed by a heading indicating the time and place of its contents. The book also includes a map, a summary of the original Prince of Nothing trilogy, and a list of characters divided into ‘Factions’. The narration is in the third-person, present tense via several POVs—mainly Esmenet, Kelmomas, Achamanian, Sorweel and Psatma, while the Aspect-Emperor hovers over the novel, sometimes literally, and steals any scenes in which He is present. 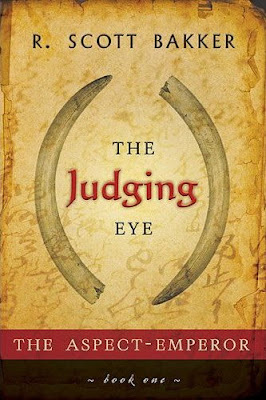 “The Judging Eye” features three main threads: 1) the happenings in Mommen in the absence of Kelhus, the Great Ordeal host and Esmenet; 2) Kelmomas in the Palace, the Yatwer cult and Sorweel; and 3) Achamanian and his quest which is the most interesting and exciting thread for me so far. The novel itself comes to a natural stopping point and I am looking forward to its sequel. 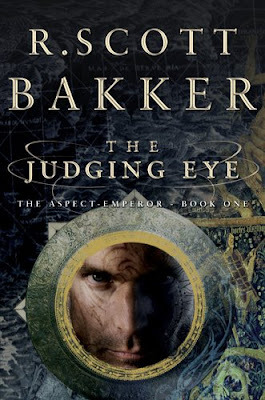 “The Judging Eye” will first be published in the UK in Paperback on January 15, 2009 via Orbit Books, then in Canada (see inset) in Paperback on January 20, 2009 via Penguin, and in the U.S. in Hardcover on February 19, 2009 via Overlook Press. PLOT HINTS AND ANALYSIS: The Prince of Nothing trilogy, with its unforgettable cast of characters, superb world building and a tightly constructed plot with a clear beginning and end, is a towering monument in the landscape of current epic fantasy. In comparison, “The Judging Eye” is more accessible as a first volume, with smoother prose, but—at least for now—the book lacks the truly memorable characters that made the first series so good. Most disappointing was Esmenet who is only a shadow of her feisty self from the PoN trilogy. While her dual roles of Empress and mother are depicted realistically and within the constraints of the series, Esmenet's repeated whining wears thin quickly. The other main disappointment was Sorweel, a young man suffering from a trauma whose character development advances by inches while his “I am loyal to my people versus I fall under the spell of the Aspect-Emperor” inner monologue repeats itself much too often in my opinion. Considering that both Esmenet and Sorweel anchor two of the novel’s three main story threads, it made going through the book more of a slog than I expected. Fortunately, the third thread in the book, which features Achamian and his memorable companions, makes up for everything by providing both the novel’s best action scenes and the majority of the most interesting backstory. Also, whenever the Aspect-Emperor appears, He steals the show and the book is a must-read based on Kelhus’ scenes alone. His older sons also have great potential as characters but are underutilized, while Kelmomas is just seven years old. Of course it’s important to remember that it’s still early in the trilogy, and as a setup book “The Judging Eye” works well—though not at the masterpiece level of the PoN trilogy—and is full of absolutely brilliant vignettes, while the next book promises to get into the true “meat” of the story. You felt it came to a natural stopping point? I'm not sure if we are on the same page there. All in all a solid review though. Keep up the good work. Well, The Judging Eye is not PON, where each volume while containing the series arc had a great place to stop - and that disappointed me - but in the Crusade and Mommen threads I think the stopping points are natural, while Aka's thread which was the only one up to Bakker standards *had* to stop to catch up. I agree with on that 100%, its more setup than anything else. Guess we'll just be forced to read the next two books to see what happens! Any idea when the next installment is expected? I aggree with your broad thesis - not nearly as gripping as PoN trilogy. I think there's something to be said for the layers here though; Akka's storyline with Esmenet's original daughter has immense potential, and it looks as though with Cleric, Bakker is actually going to a little deeper into the nonmen/Inchoroi storyline (both of which could merit substantial prequels of their own), and given Akka's search for Ishual, there seems to be some potential for interaction between Akka's band and Kellhus, which should also be interesting. Also curious is the Kelmomas (and the parallels with Celmomas from Akka's dreams). It almost has the feel as though, with his (apparently) dual intellect, he's the truly chosen one, whose ascent will be accompanied by Kellhus' eventual dismissal from the story, a greater dismissal than Kellhus vs. his own father. This is sizeable if only because Kellhus was the nexus of the entire first trilogy!